After a random number generator (in this case, the Schmoopette picking a number between 1 and 20) selected your comment's number, the winner of the Mabel's Labels Ultimate Back to School Combo is SueLaundry for Six. Congratulations, Sue. I'll email you the instructions on how to order your labels. The rest of you should stay tuned, though, because I have another giveaway launching tomorrow! My only hint is **jazz hands**! The mail comes with about eight catalogs (shameful, I know). Two are immediately placed in the recycling bin (Honestly, what crazy and utterly misguided "posh buyers" list are we on? We're never buying a $1000 rubbish bin -- ever!). Two are immediately given to the older kids to "read" (both are Halloween costume related, so they devour them, natch). My husband disappears to the bathroom with two. Twenty minutes I take the other two up to the bedroom and find the two he had snagged. His two: Sur La Table and REI. My two: Hanna Andersson and Tea Collection. That says a lot about who we are, I think. He's all about cooking and finding ways to get outdoors more often. Meanwhile, I'm clearly in need of a children's clothes detox. "But look, honey, this season's collection is based on Old Hungarian fabrics and patterns!" Three weeks ago I had the amazing opportunity to take a VIP tour of the Wizarding World of Harry Potter at Universal Studios. I know many of you are wondering what I thought about the theme park, so I'm happy to finally point you in the direction of my Inside Movies post about my adventures in "Hogwarts" and "Hogsmeade." 10 Reasons to Take Your Kids to Hogwarts (Theme Park). My husband and I received some awful news yesterday. I can't share the exact nature of the potentially devastating news, but I can share a fitting analogy. Let's say you filled out a lottery form in the old-school fashion of bubbling in numbers. Your numbers come up, and you think you've won a significant payout -- not the huge mega-million one, but one that will change your life in so many ways you've already begun to figure out how you'll spend the cash. Just as you're wrapping your head around what the payout will mean for your family, the lottery commission calls to say that they've evaluated your official form, and it's unclear whether you indeed bubbled in the correct numbers or not (I know this is improbable, but go with it). Then they tell you that hope isn't all lost, because there will be a special hearing to decide whether you are entitled to the lottery winnings. But if you go through with the hearing, there's a small chance you'll not only NOT WIN the money, you may actually be charged a hefty fine instead. The answer seems obvious -- you take the risk of the fine, because the potential winnings are so great. You close your eyes and pray, because you know in your heart it's a technicality, that those numbers are really yours, that you're entitled. But it's out of your control. It's not something you can weigh in on; there's no oath you can swear that will magically sway the commission's votes in your favor. It is absolutely out of your hands. All you can do is hope that you really did win, that your tiny error in shading in the damn bubbles won't come back to haunt you. That if by any chance you don't win (God forbid! ), you'll survive and move forward and not wallow in self-loathing or guilt or what-ifs. 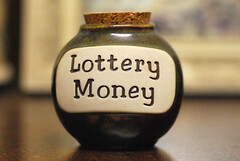 If you're reading this, you probably care about me, so I'm asking you, please pray, hope, wish upon a star that the "lottery commission" will grant us our winnings. That the situation we find ourselves in will get resolved, so we can stop obsessing over it and move on with the blessings we'd already started counting. Heading to BlogHer: All Aboard! This morning I'm headed to BlogHer for the third consecutive year, and I've been lucky enough to catch a ride on the "Hershey Train," which despite sounding like a naughty euphemism, is quite literally a Hershey-sponsored Amtrak ticket from the DC area to New York City. We've dubbed it the S'mores Road Trip to BlogHer, and some of my very favorite women will be on it too. S'mores bring back some wonderful memories for me. I didn't grow up going camping, but I did have S'mores at youth-group retreats and years of sleepovers with my best firends. As an adult, my outdoorsy Boy Scout of a husband turned me on to the joys of having real, honest to God, campfire-made S'mores. We've had them backpacking as a young couple in the Grand Canyon and car camping as a family of five in our nearby state park. To my kids, S'mores are a family treat enjoyed best under the stars. My husband and I look up, star-gaze, and delight in the family we've made together. For those of you who love S'mores and will also be attending BlogHer, you can check out Hershey's S'mores "Snacktivity" Suite in room 4233 at the Hilton for some chocolaty swag. As part of the S'mores Road Trip to BlogHer I received a round trip ticket on Amtrak to the convention, as well as some Hershey-branded items. Any views expressed in this post are obviously my own.